The crash of an Amtrak train near Baltimore, the collapse of the Hyatt hotel in Kansas City, the incident at Three Mile Island, and other large-scale technological disasters have provided powerful examples of the ways that communication practices influence the events and decisions that precipitate a disaster. These examples have raised ethical questions about the responsibility of writers within agencies, epistemological questions about the nature of representation in science, and rhetorical questions about the nature of expertise and experience as grounds for judgments about risk. In The Rhetoric of Risk: Technical Documentation in Hazardous Environments, author Beverly Sauer examines how the dynamic uncertainty of the material environment affects communication in large regulatory industries. 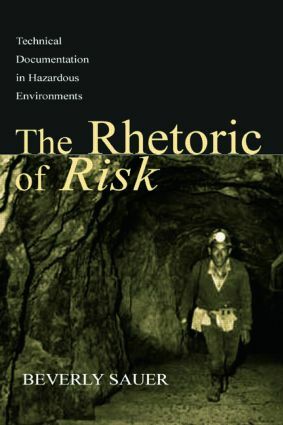 Sauer's analysis focuses specifically on mine safety, which provides a rich technical and historical context where problems of rhetorical agency, narrative, and the negotiation of meaning have visible and tragic outcomes. But the questions Sauer asks have larger implication for risk and safety: How does writing function in large regulatory industries? What can we learn from experience? Why is this experience so difficult to capture in writing? What information is lost when agencies rely on written documentation alone? Given the uncertainties, how can we work to improve communication in hazardous and uncertain environments? By exploring how individuals make sense of the material, technical, and institutional indeterminancies of their work in speech and gesture, The Rhetoric of Risk helps communicators rethink their frequently unquestioned assumptions about workplace discourse and the role of writers in hazardous worksites. It is intended for scholars and students in technical writing and communication, rhetoric, risk analysis and risk communication, as well as a wide range of engineering and technical fields concerned with risk, safety, and uncertainty.